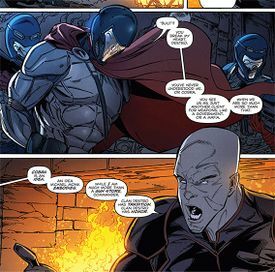 This article is about the second Cobra Commander in the main story. 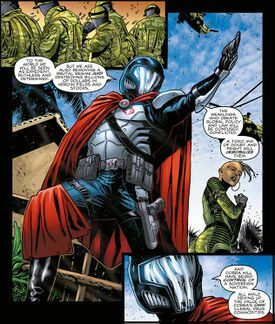 For his predecessor, see Cobra Commander. For a list of other meanings, see Cobra Commander (disambiguation). "Listen up, fours, an eight is speaking!" The true name of the man once called Krake is unknown. 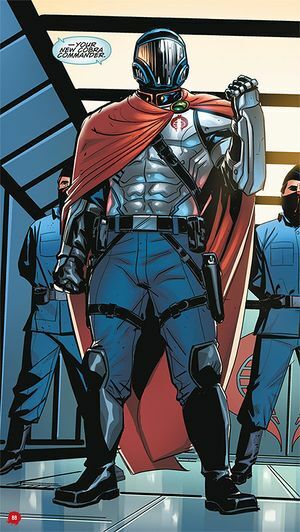 Born in blood and raised in the drug fields of the Golden Triangle, the loss of his parents to the region's narcoculture hardened him, and set him on a path that saw him become a soldier of fortune, an assassin for his government, and an agent of Cobra, until finally, he ascended to the position of Cobra Commander. A born leader of men, able to envision and realize his objectives with a clarity and capability possessed by few other people on the entire planet, intensely proud but resignedly nihilistic, Krake was happy to deal death and duplicity to rise through the organization's ranks. 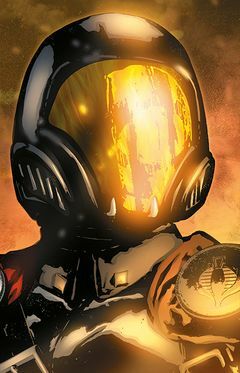 Upon securing the position of Commander, he immediately saw to it that Cobra would leave the shadows behind, becoming a legitimate world power under his absolute leadership. 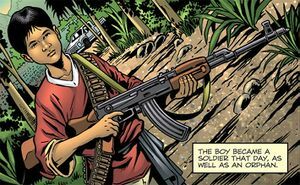 The child who would become Krake was quite literally born on the battlefield, when his mother gave birth in the midst of an armed conflict over the poppy fields of Southeast Asia's Golden Triangle. The midwife observed that the infant had "the eyes of a tiger." The boy's father was killed by a grenade seconds later, and his mother was forced to flee with him in her arms as their lands were overtaken. As the years passed, the boy and his mother found work harvesting poppies for the native drug runners, until one day, when his mother was assaulted by local enforcers. Snatching up one of the men's guns, the boy opened fire on the men.. but by the time the clip was empty, his mother lay dead alongside them. Orphaned and alone, the boy did what he had to in order to survive, killing to make money and amassing a group of loyal followers. Known to his men as "Tiger Eyes", he was revered for having what seemed to be preternatural luck—a claim he privately dismissed, as his short life had taught him that one made one's own luck in life that had no meaning. His "luck" ran out when he and his men where captured by Thai military police, but, ever the self-preservationist, he did not hesitate to agree to kill for his government in order to save his own life. 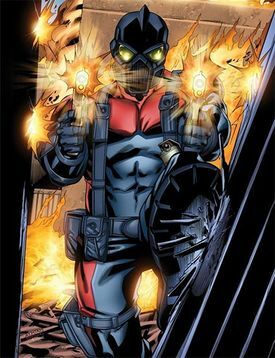 Once he had completed his mission and been paid, however, he promptly killed his handler and returned to his old life. 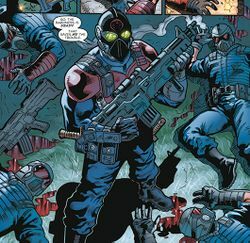 Arriving to a meeting with a local criminal named Trahn, Tiger Eyes found that Trahn and his men had all been slain by a death squad led by Sebastian Bludd, so that Bludd's mysterious employers could take control of Trahn's operations. Bludd intimated that an inside source had helped them in their mission, and that one of Tiger Eyes's men was also an informant. 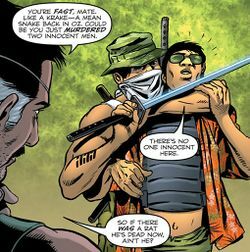 Rather than attempt to root out the traitor, Tiger Eyes slaughtered all his men on the spot—a merciless act that inspired Bludd to compare him to a krake, an especially mean breed of snake from his home country of Australia. Duly impressed, Bludd informed "Krake" that he would now be working for his unknown masters as well. Despite Major Bludd's claims, there's no such real-life snake as a "krake." This page was last edited on 15 October 2018, at 15:54.